Posted by Steve Krizman in Business books, Cheat Sheets, Communicate to influence, Marketing and PR, Organizational communication, Organizational culture with 0 comments. The Corporate Executive Board discovered a curious thing when it examined performance of more than 6,000 sales reps around the world. The most effective sales people were not the “Relationship Builder” types that sales training had emphasized. They were a less common breed of cat who challenged their clients to think outside the box. The CEB found the evidence so compelling that it has developed the “Challenger Sale” model and is preaching its virtues to any industry looking to break through stagnant sales and lost opportunities. 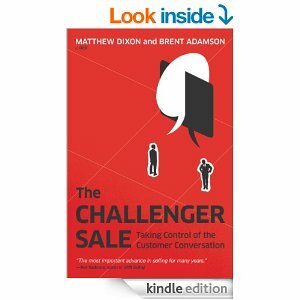 Its book on the subject, The Challenger Sale, by CEB’s Matthew Dixon and Brent Adamson, is sweeping the sales world. Its lessons should be absorbed by those of us who support sales with marketing strategy and communications. When our colleagues decide to go this route, they will be asking for different kinds of support than we currently provide. And I think our expertise will be better used in this model. Research shows that the most effective sales reps have more than a good relationship with their clients. They actually challenge them to think broadly about how to solve their business problems. These “Challenger Sale” reps teach the client something new, tailor a solution to uniquely fit the client’s need, and control the sales conversation, unafraid to talk about features and price. The Corporate Executive Board’s research shows that these three questions are THE most important in gauging a company’s loyalty to a supplier. advocate on this supplier’s behalf across your organization? Challenger sales people get deeper into their clients’ business. They start by understanding the issues rocking the client, its industry, and its decision-makers. What gives them a competitive edge? What blunts their edge? What is happening on the leading edge of its industry? The CEB describes three key abilities of the Challenger sales person: teaching, tailoring, and controlling. Teaching: With a deeper understanding of the client and its business, the Challenger sales person is able to help the client think creatively and consider alternatives. Tailoring: Having sparked a dialogue that is richer than the typical sales pitch, the Challenger sales person is able to tailor his or her product or service to help the client address unique business needs. Controlling: Having built a solution together with the client, the Challenger sales person can help the client stick to the features and the price it will take to deliver them. The authors shared the example of a pharmaceutical supplier whose sales team needed to stand out from the crowd in order to get quality time with physicians. Their marketing team dug into the company’s deep store of information about patient experience with chronic illness and created stories that describe “patient journeys.” The information did not sell the pharmaceutical company’s product, but did provide physicians information about patient experience that occurs outside their exam room. This information helped the physicians tailor their treatment plans to the patient experience, and the pharma sales person was there to help provide the goods. In another example, a team from across the organization came together to help the Challenger sales rep prepare for a presentation to a CEO of a prospect company. Everyone in the organization who had interactions with the company and CEO shared what they knew, helping the sales rep tailor a presentation that met the CEO’s concern about customer satisfaction and his interest in using technology to solve problems.